Cadillac is renowned for luxury vehicles, but when it comes to motorsports involvement, it is in a class of its own — and it didn’t start with the CTS-V. Advanced power developments stemmed from World War II aircraft engine technology, fueled by then-ultramodern high-octane. In 1949, the first overhead-valve V-8 emerged from Cadillac’s production line. The short-stroke, 331-cid, 160-horsepower engine was a benchmark in automotive technology and 220 pounds lighter than its predecessor, the 346-cid, 150-hp L-head V-8. The power plant offered unparalleled performance paired with a substantial gain in fuel economy. In a 1949 issue of Mechanix Illustrated, automotive journalist Tom McCahill reported, “With this engine, Cadillac, despite its large size, outperforms just about every car being made.” Out of any car he tested that year, none could match the Cadillac’s 12.1-second acceleration from 0-60 or its 169-mph top speed. Meanwhile, Motor Trend magazine recognized the Cadillac as its very first “Car of the Year,” despite competition from Oldsmobile. Automotive journalist John Bond wrote, “While both have outstanding new V-8 engines, they are not by any means the same. The Cadillac, with 10-percent more piston displacement than the Olds, develops 18.5-percent more bhp and weighs a few pounds less." 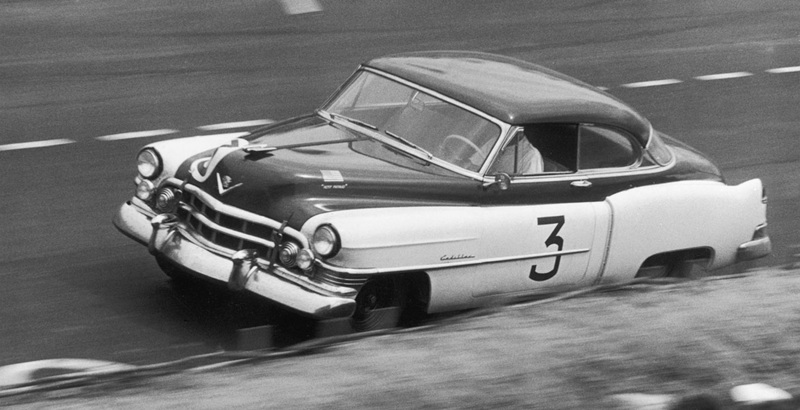 Within months of production, mostly-stock Cadillacs adorned with bold racing numbers were laying down rubber on racetracks, and they found almost immediate success at various venues and distances. 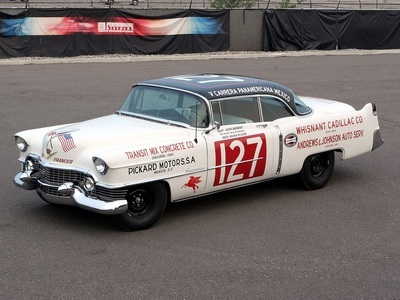 Renowned Indy driver Paul Russo won the 1949 Milwaukee 100 stock car race, Red Byron placed third in NASCAR’s 1950 Southern 500, and Tom Deal, driving a Cadillac Series 62, finished second in the ‘50 Carrera Panamericana road race in Mexico. In 1950, an aero-bodied Cadillac traveled the long, winding road to the 24 Hours of Le Mans endurance race with Briggs Cunningham and team. Despite a half-hour of digging the car out of a gravel trap, it earned a respectable 11th-place finish and was affectionately named “Le Monstre” by its French fans. Cunningham’s team also competed with a stock-bodied Series 61 coupe that came to the checker in 10th, and drivers Tom Cole and Sydney Allard entered their Cadillac-powered Allard J2, which earned third-place overall and first in their class. In June 1951, Gober Sosebee earned a second-place finish on a half-mile dirt track in the 100-mile NASCAR Grand National, and Buck Baker won a 250-mile NASCAR Speedway division race in ‘52 behind the wheel of a Cadillac-powered indy-style racecar. Three years later, Colorado racers Keith Andrews and Blu Plemons dominated factory-backed teams with their privately funded 1954 Cadillac Series 62 coupe in the 1,908-mile 1954 Carrera Panamericana. The car has since been re-created by the General Motors Performance Division. Through the next three decades, Cadillac continued to refine performance, handling and safety. Fast-evolving microprocessors and electronically-controlled systems meant that Cadillac would be the first to use electronic fuel injection in 1975, and the manufacturer would produce the first front-wheel-drive vehicle with electronic traction control in 1990. Speed-sensitive steering and computer-controlled suspension were offered in 1993. When Cadillac revealed the premium 4.6-liter, 300-hp Northstar V-8 in 1992, GM Racing’s lineup of competition versions followed, including the 650-hp twin-turbo that powered the Cadillac Northstar Le Mans Prototype in the American Le Mans Series. But the most potent high-production small-block was still to come, in a rugged, luxurious package otherwise known as the CTS-V. Upon the 2004 CTS-V sedan’s release, Cadillac entered into the aggressive SCCA Pro Racing World Challenge GT Championship with seasoned drivers Johnny O’Connell and Andy Pilgrim. The team won the Manufacturer’s Championship and Pilgrim walked away with the Driver’s Championship in 2005, which set the standard for future achievements. 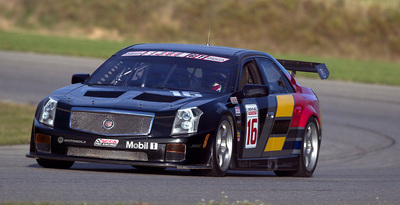 By 2011, Cadillac entered the Pirelli World Challenge GT Series, and the team won Mid-Ohio and Road Atlanta. Cadillac owned the World Challenge Manufacturer Championships in 2005, 2007, 2012, 2013 and 2014, and O’Connell won the World Challenge Driver’s Championships for 2012, 2013, 2014 and 2015. In all, Team Cadillac accumulated 30 wins, 27 pole position starts and 96 podium finishes from 2004-2015. In the opening round of the Pirelli World Challenge Series at the Circuit of the Americas in Austin, Texas, in November 2014, Johnny O’Connell and Andy Pilgrim excitedly pulled the cover off Team Cadillac’s new racecar, the 2015 ATS-V.R Coupe powered by a 455-hp, 3.6L V-6 twin-turbo. Larger twin BorgWarner turbochargers, increased capacity intercoolers and a dual side-exit exhaust are a few notable upgrades from the factory version. Michael Cooper joined O’Connell for the 2016 race season, and the Team Cadillac continues to be the most accomplished team in the Pirelli World Challenge. According to Cadillac.com, Cooper stated that the Cadillac ATS-V.R is the epitome of a race car. "The horsepower from the Twin turbo GM LF4.R engine, downforce of the GT3 spec body and its nimble chassis create a rewarding experience for the driver that is unmatched in anything I have raced... It is just plain wicked."